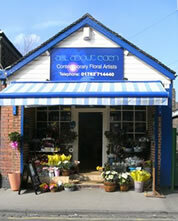 All About Eden is a leading, top quality florist in Newcastle under Lyme & Stoke on Trent, Staffordshire. As one of Staffordshire's leading florist shops we can make and, deliver anywhere in the UK, a wide selection of beautiful wedding flowers, funeral flowers, funeral tributes, Valentines Day flowers and corporate flowers. Same-day delivery is available on orders made before 2pm. All wedding flowers, funeral flowers, funeral tributes, Valentines Day flowers and corporate flowers are made by our team of highly experienced and professional florists. They will ensure that all wedding flowers, funeral flowers, funeral tributes, Valentines Day flowers and corporate flowers are beautifully arranged to the clients exact requirements. Flowers used in our beautiful arrangements are all of the highest quality and freshly delivered to our florist shop. Here at All About Eden we are a local florist with the ability to deliver wedding flowers, funeral flowers, funeral tributes, Valentines Day flowers and corporate flowers all over the UK and abroad. We are a family run florist that promises a friendly and reliable service. To find out more, please get in touch.